A gypsy moth caterpillar in Pembroke in 2016. Tammy Morey woke up one morning last spring to find itchy welts lined up on her arm. Soon, they appeared on the back of her neck and legs, spawning an itch so fierce she couldn’t sleep. A few weeks ago, the bumps appeared again on her arm, and after a walk by the cranberry bog near her home in Carver, Morey found herself in an agony of itching. Any number of irritants can cause a rash like that, but Morey’s doctor thought the likely culprit was gypsy moth caterpillars, newly abundant in the region. These bugs don’t bite, but their tiny hairs can trigger an allergic reaction, providing yet another reason to hate the invasive critters, which are just starting to munch on tree leaves and pepper backyard decks with droppings. Gypsy moth rashes were first documented in the early 1980s, during the last major infestation in the Northeast. About 10 percent of the people who lived in high-infestation areas were affected by the rash, which does no harm and disappears without leaving any scars. “No treatment is necessary unless people are uncomfortable from the itch,” said Dr. Daniela Kroshinsky, director of inpatient and pediatric dermatology at Massachusetts General Hospital. Most people can ease the itch with over-the-counter antiitch creams or an antihistamine, she said. But Morey, a 43-year-old bartender and mother of three, is so sensitive and suffered so severely that her doctor prescribed a steroid to quiet her body’s overreaction. 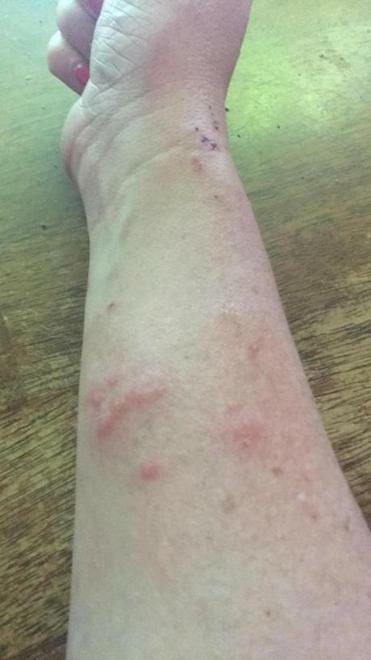 Plymouth resident Tammy Morey received a rash on her arm from gypsy moth caterpillars. “People laugh at me because I make such a big deal, but they have no idea what it’s like,” Morey said. Her husband, meanwhile, works in the cranberry bog all day and comes home rash-free. As a joke, because her friends were ribbing her, Morey started a Facebook group called “Gypsy Moth Rash Support of Greater Plymouth Area.” But Facebook users took it seriously and soon started sharing photos of rashes and advice on itch relief. The rash from gypsy moths is no different from any other rash caused by allergens or irritants, said Dr. Peter Young, a dermatologist at Atrius Health’s Harvard Vanguard office in Quincy. Gypsy moths are suspected because the rashes are showing up when the caterpillars are plentiful. Other caterpillars could be responsible, but the rashes are appearing just as gypsy moths have hatched and begun crawling. Young saw several cases last year, and this year “it’s only a matter of time,” he said. People can be exposed even if the caterpillar doesn’t come into contact with their skin, Young said. Their hairs can waft in on spring breezes and land on the skin or on clothing left out to dry. 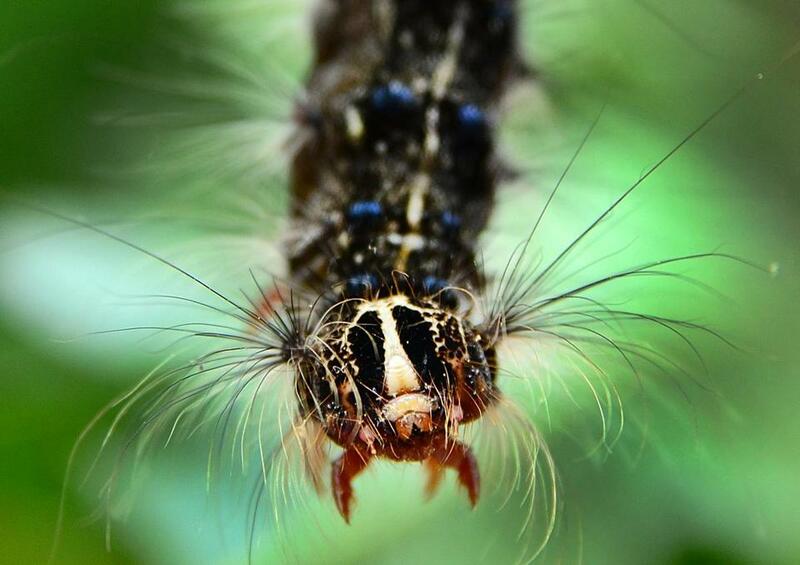 In most places around the state, gypsy moth caterpillars have hatched and started spinning the silk threads they use to swing to leafy branches. But they are still tiny and won’t get big enough to do major damage until next month. “We haven’t seen any major defoliation yet,” said Ken Gooch, forest health program director for the Massachusetts Department of Conservation and Recreation. Last year, gypsy moths chewed the leaves off 350,000 acres of forest, mostly in Central Massachusetts and on the South Shore and Cape Cod, Gooch said. Combined with three years of drought, the stress cost many trees their lives. The drought also played a role in the moths’ ascendance: A fungus that was introduced accidentally from Japan in 1989 has kept gypsy moths in check for years but couldn’t grow in the recent dryness. Meanwhile, to protect trees, Gooch recommends that homeowners hire a licensed arborist to spray with a biologic pesticide that won’t kill birds or bees. While caterpillars are attracting attention, another tiny woodland creature is also quietly emerging this month — and the rash this one causes should not be ignored. The minuscule deer ticks that transmit Lyme disease are in their peak season, and they thrive in dampness. When a tick transmits Lyme disease, the bacteria often (although not always) produce an expanding red rash. Sometimes, the rash appears in concentric rings, the telltale bull’s-eye. But often it is simply a flat red patch, rarely itchy or painful, that grows over days or weeks. Such a rash warrants a trip to the doctor. Lyme disease is easier to treat the sooner it is detected, and the distinctive rash is an important sign of infection. Other early symptoms are fever, chills, headache, fatigue, muscle and joint aches, and swollen lymph nodes.